The Hugo Loughran GP will open for entry today, Monday 11th April, at 7.00pm on www.entrycentral.com. There will races for A3's and A4's as well as the Masters. The Hugo Loughran GP takes place on Friday 29th April and has grown in popularity over the past number of years. With action for the A1 and A2 riders taking place over that weekend at the Tour of Ulster the Hugo Loughran provides an ideal vehicle for ambitious riders to gain points. There were wins all around when Bann Valley CC promoted their annual Bann Valley Classic today. There were three races on offer and the riders had to tackle the tough, rolling circuit. As usual Bann Valley had done a tremendous job in seeing to the safety of the event and had lots of marshalls out along the route. The weather was dry and sunny but very cold. The Hayes Fuels Ernie Magwood Super 6 Time Trial League got off to a great start this morning at Toome. 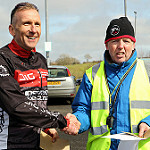 Over sixty riders braved the cold and blustery conditions to tackle the ten mile course from Toome to the Castledawson roundabout and back.The event promoted by Island Wheelers was well organised and marshalled. It was all hands to the deck today for Island Wheelers when they promoted their PJ Logan Cup. With four races in the afternoon they also promoted Youth racing in the morning when PJ Doogan made up for his mishaps yesterday by taking a win in the U16 event. David Watson of North Down showed no signs of tiredness after the weekend's Tour of the North when he romped home to victory in the Ciclisport GP promoted by East Tyrone CC. He was quickly followed in by Aaron Swan of Ballymoney and David Hamilton of North Down who had a close battle for second and third.